I have always been a huge fan of Coach. At my last job I always got fun cash bonuses that I would take a splurge on a new bag. No such luck at my current job. Isn't the beachy one just so freaking adorable? And I love the color of the green one-I would literally give anything for one of these bags. But for now I'll just day dream. 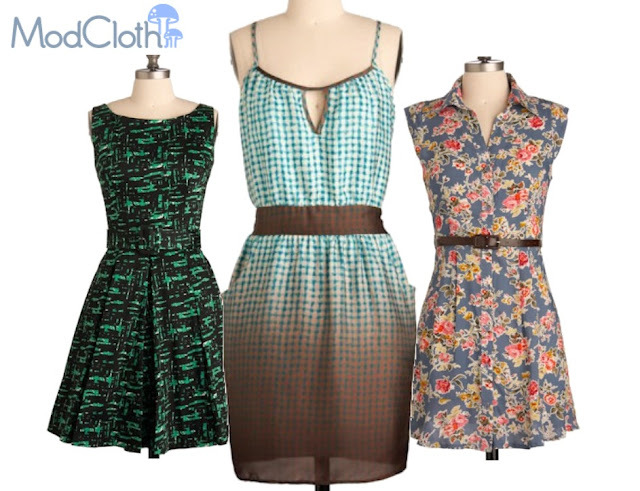 Have you shopped at ModCloth yet? They have the cutest selection of dresses I have seen anywhere. I seriously want everyone of the dresses they offer. They also have a great blog, and they do this blogger of the moment feature where then then name a dress after you! What a cool honor! These three dresses are my absolute favorites. They even have the cutest names- When I Dip! When I saw the green one and the plaid one I had to forcefully talk myself out of buying them. It's bad when I'm already putting outfits together with a dress I don't own. I adore Anthropologie but can not afford it at all. 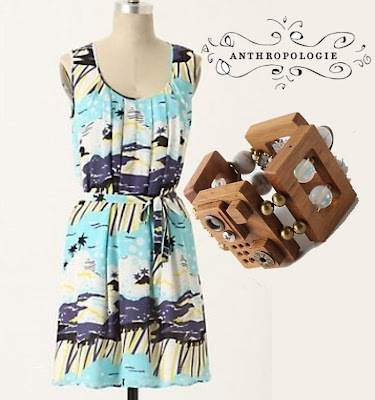 Anthropologie is the site I love to go to when I want to lust over clothing and jewelry. I am so intrigued by this bracelet and am curious to see if it is something I could make. This dress is also so adorable and versatile- black cardi and some nice heels for work and then some fun sandals and jewelry for play. How about a fun pair of heels to dress up any outfit? 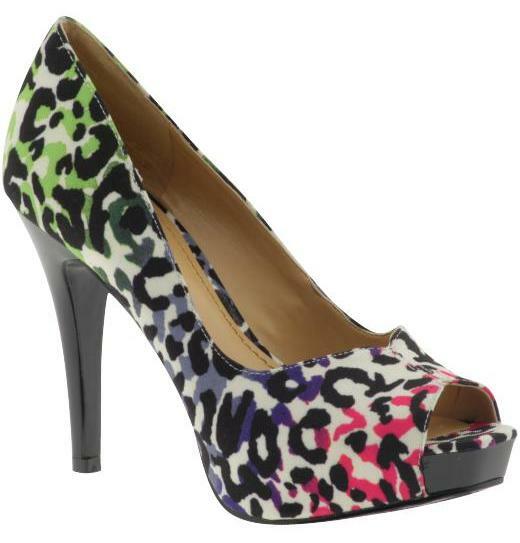 I love this pump, and I love even more the fact that it comes in other colors. I just wonder how comfortable it is. 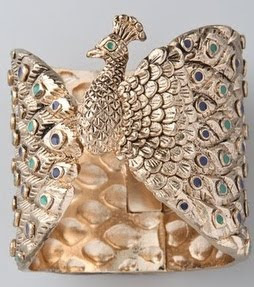 When I first got my peacock ring from the House of Harlow 1960 line from Shopbop.com I fell in love. I've worn it in numerous posts (seen here and here) and get many comments about it. So when I saw that they now offer a bracelet (here)I was thrilled. It's so fun! What do you think of this shirt from Madison Marcus? It's the Radical top and I'm kind of really liking it. I love the different textures and lines in this shirt. Last thing I've found that I'm in love with is this snake print blouse from Equipment. It's called the Daddy Blouse and the style does vaguely remind me of a shirt my dad would wear. Of course his shirt would not be sheer or snake print which is why I love it. What do you think? This was sorta fun! My feet aren't tired and I'm not in more debt. Of course it would be better if these items were truly in my closet. So tell me, my shopping companion, what are your thoughts and opinions on these items in my faux shopping bag? PS-Don't forget to enter the Hana Flat Iron Giveaway (here) It ends Monday! PPS-Have you stopped by my shop (here) lately? I love the "radical top". Looks like it probably hangs well too. wow that peacock ring is amazing! I will definitely have to check out the cuff version of it! also love the last sheer snakeskin blouse....i am a sucker for snakeskin and sheer so its perfection!! 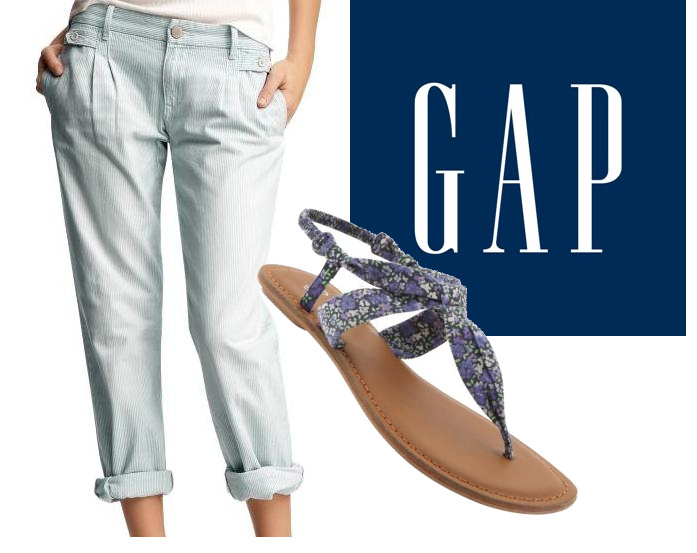 I love the peacock ring, and seriously, the gap pants are sooo comfortable. You would love them!